Everything seemed to set up so well at the 2019 Australian Open for Milos Raonic – playing in the quarter-finals against Frenchman Lucas Pouille (above) in Rod Laver Arena. He defeated tough opponents Nick Kyrgios and Stran Wawrinka in the first two rounds and then scored dominant wins over Pierre-Hugues Herbert and No. 4 seed Sascha Zverev. He was serving great, pounding the forehand as well as ever and driving guys nuts with the consistency of his sliced backhand. His record against French players was 51-14 overall and he was 10-1 in his last 11 matches against them – the only loss coming when he had a left wrist injury that prevented him from hitting two-handed backhands against Adrian Mannarino at the 2017 Rogers Cup in Montreal. He went into Wednesday’s match 3-0 against Pouille (Stuttgart 2018 and Brisbane and Aussie Open in 2016) without dropping a set. With a potential semi-final looming against Novak Djokovic on Friday, Raonic was beaten 7-6(4), 6-3, 6-7(2), 6-4 by Pouille. It was a strange match with Raonic breaking serve on his first break point in the first set to lead 2-0 and then failing to serve out the set at 5-3. Also, that break point was the only one he had the entire match. He managed to win the third set but it was getting obvious that he wasn’t physically right. There had been a suspicion something was going on earlier in the tournament when his media conference after the Herbert match got delayed twice, and it took him more than two hours to come to the interview room. The bottom line here is that a right-knee meniscus issue has emerged again. It first cropped up, that we know of, during off-season training at the end of 2017. He was actually hitting balls seated in a chair in December, 2017. He desperately wanted to play the 2018 Australian Open, especially after missing the 2017 US Open following a left wrist surgical procedure, but was not properly prepared and lost in the first round to No. 86-ranked Lukas Lacko. In April, 2018, he pulled out of a match with Marin Cilic in Monte Carlo with a knee problem and then played in Madrid losing to Denis Shapovalov before skipping the rest of the clay-court season, including Roland Garros, with concerns about the knee. During the fall ATP 500 event in Vienna, he was treated on court for the knee during a loss to Jurgen Melzer. The knee didn’t seem to obviously bother him during the first four rounds at this year’s Australian Open when he played some of the best tennis of his career. But after losing to Pouille he spoke about the problem in his media conference with regards to whether he would play Davis Cup in Slovakia indoors on clay February 1-2. Anytime anyone mentions surgery, it’s not a minor injury. Raonic’s serve speed numbers were down against Pouille. His fastest serve was 216 km/hr compared to 222 vs. Wawrinka in the second round. His average first serve speed was 193 versus 201 against Wawrinka and his average second serve speed was 166 compared to 176 against Wawrinka. It appears there’s no chance for Davis Cup next week and then any possible return to the tour would not be until the ATP 500 in Rotterdam the week of February 11th. There has long been talk of Raonic winning a Grand Slam and it involved playing well, having a good draw and taking advantage of the moment. At the 2019 Australian Open it looked to be breaking his way after getting through Kyrgios and Wawrinka in the first two rounds and Herbert and Zverev in the third and fourth. Then with Djokovic, if he had beaten Pouille, possibly having a back issue and being vulnerable in the semi-finals (something that did not materialize against Pouille on Friday), it would have been Rafael Nadal – with whom he has a 2-2 record on hard courts since 2015 – in the final. Unfortunately it did not work out but, having lost in the first round a year ago, his ranking should rise from No. 17 to No. 14, the highest it’s been since October, 2017. During the Australian Open, Raonic mentioned several times that it doesn’t take him very long to get match sharp if he’s fit. Unfortunately, it appears at the moment that staying healthy is more of an issue for him than playing at a level to compete with the best. Over the years there haven’t been many occasions when two Canadian women were in the top-100 and played each other. On Friday, at the Oracle Challenger Series tournament, a $125,000 WTA event, in Newport Beach, California, it will be (3) Genie Bouchard with a live WTA ranking of No. 72 vs. No. 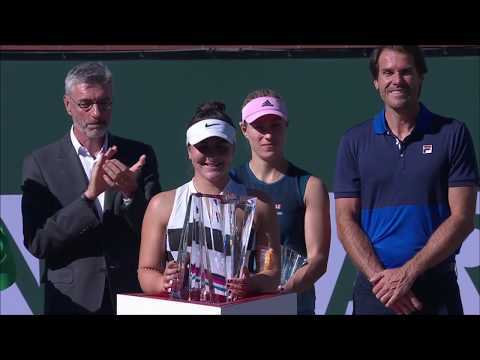 80 (6) Bianca Andreescu. It will be their first-time meeting as pros. The winner will advance to the semi-finals against either No. 74-ranked Tatjana Maria of Germany or No. 127 Nicole Gibbs of the U.S. In the round-of-16, Gibbs defeated Katherine Sebov of Toronto 6-1, 6-2. Still alive in the men’s Challenger in Newport Beach is (16) Brayden Schnur of Pickering, Ont. He beat No. 81-ranked (3) Mackenzie McDonald of the U.S. 6-2, 6-4 in the round-of-16. He will face No. 120 Jason Jung of Taipei in the quarter-finals. Defending Australian Open mixed doubles champions Gabriela Dabrowski and Mate Pavic of Croatia were eliminated in the quarter-finals of this year’s event. The top seeds lost 6-1, 4-6, [11-9] to the unseeded pairing of Maria Jose Martinez Sanchez of Spain and Neal Skupski of Britain. In the junior girls singles, No. 4 seed Leylah Annie Fernandez advanced Friday to the final with a 6-1, 6-3 victory over unseeded Anastasia Tikhonova, 18, from Russia. In Saturday’s final, the 16-year-old Fernandez, from Montreal but now residing in Florida, will face top seed Clara Tauson from Denmark. Last week at the Traralgon Junior International event in Australia, Tauson, also 16, defeated Fernandez 6-3, 6-2 in the final. Fernandez best junior Grand Slam event result before this year’s Australian Open was a semi-final finish at the 2018 French Open. In the junior boys event, after beating top seed Lorenzo Musetti 6-3, 6-0 at the Traralgon Junior International last week in very windy conditions, 17-year-old Liam Draxl (15) of Newmarket, Ont., was beaten 6-4, 7-5 by the 16-year-old Italian No. 1 seed in the third round of the Australian Open junior singles on Wednesday. These colourful creatures can be found in the Melbourne suburbs. They’re ‘scaly-breasted lorikeets.’ It’s impossible to tell the females from the males – both have the same feathering and colouring. NOTE: The next Tebbutt Tuesday will be from Bratislava as Canada prepares to play Slovakia in Davis Cup.